Luminous... There are wonderful stories... M. T. Anderson’s “Quick Hill” is a tour de force of contemporary short fiction. It does, as well as anything I’ve read recently, what scary stories are supposed to do: It says what we feel, but cannot say. From vampires to ghosts and from strange creatures made of mercury to half-harpies, these beasts will broaden readers’ perspectives. Teens will never think about monsters in the same way again. Long after the last page is turned, these tales will linger in readers’ brains, in their closets, under their beds, and in the shadows. Link and Grant present an engrossing, morally complex anthology of 15 stories centered on the seemingly antagonistic concepts of monsters and love. ... All of the entries are strong, and many are splendid. The authors of these tales brilliantly intertwine morally charged issues with elements of horror writing that engage the reader. ... This is a must-read for anyone who enjoys horror fiction. A deliciously gory collection of fifteen original stories... While the theme is certainly familiar, the diversity of interpretations of monsterhood is an asset, and the book sets a fresh and amusing note with the opening pop quiz that assesses readers’ views of monsters. ... Fans will be happy to find a well-edited, sharp collection of new stories about their favorite topic that covers both the creepy and alluring elements of monsters. Short stories with otherworldly creatures may be a dime a dozen, but rarely do they offer such nuanced scope. Link and Grant ... know their way around excellent short fiction, and their editorial skills are on display here. From the light(ish) and delightful to the subversively unromantic, from humor to horror, each entry both tells a good story and says something about monstrousness. ... An anthology of riches, even if they aren’t always fair of form. Link and Grant clearly spent a lot of time building this collection, which includes a graphic entry, and consequently none of the stories disappoint. Authors such as Cassandra Clare and Patrick Ness—along with the monster dripping blood on the cover—will draw in readers eager for creepy, atmospheric tales. A delightful (often frightful) anthology of short fantasy fiction. ... The strong writing brims with misdirection, humor, horrors and twisty endings. ... This substantial volume will provide older teens—and adults—with hours of thoroughly enjoyable reading. A monstrously entertaining anthology. Provocative. One would expect no less from veteran anthology editors Kelly Link and Gavin J. Grant. ... Beautiful language. 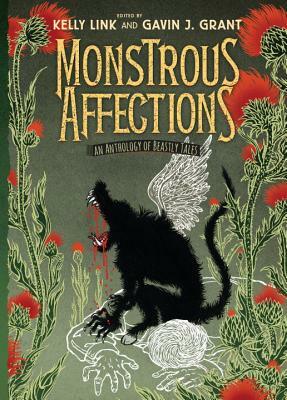 For those who like a mix of fantasy and science fiction, "Monstrous Affections" is a stunning collection of original tales whose title explains it all. Who cares if it's nominally a young adult book — it's the best collection of monster stories of the year, with some unusual ideas as to what really makes a monster.